There are several helpful accessories that are offered at Green Goddess to make this unpleasant task a bit more manageable. Gloves – grill pro gloves are an essential item to begin your grilling adventure as well as completing it. These gloves are made to withstand intense heat. So whether you are turning over that delicious steak or scraping off that unwanted grease, these gloves are a must! Ash tool kit – this is used to gather up all the ash that has accumulated at the bottom of the grill. It is important to eliminate this ash build up so it does not become solidified into a concrete like substance which is almost impossible to clean. This scraper is used to drag the ash to an area of elimination from the grill. Grate brush – The grill pro is a brush used for those grates after you have allowed the heat to burn off the excess grease. By brushing each grid you will eliminate any unwanted food or grease that has lingered on the grates. It is important to replace these brushes if used extensively so as to keep it in optimum condition. 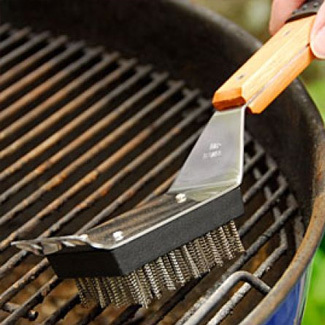 Grate cleaner – the grill pro grate cleaner is a round brush for those hard to reach places. Grate wire – the grill pro grate wire has a unique shape and function in the cleaning of your grill. It has a small looped wire at the end of long tong type handle which enables you to get between those nasty grates to clean out that stubborn build up. Covers – It is important that after you have enjoyed a delicious meal, burned off the excess grease and food off your grill, allowed it to cool down that you protect it from the elements by covering it with a Green Goddess It will keep the moisture out keeping your grill rust free! Remember, it is very important to keep your smokers and grills clean. Grease build-up does not allow you to taste your food the way you want it to taste! Lastly, you certainly do not want a grease fire!